What mama did. I can’t pinpoint just one thing. My mom did so much. She still does. Some people don’t get the opportunity to thank their Mother while they are still here. We don’t think of it, we think we’ll always have tomorrows. Today I’m grateful for the opportunity to thank her while she’s still here. As a parent, you never know what leaves a mark on your child. My Mom’s touch did that for me. Some of my favorite childhood memories were sitting on our front porch listening to thunderstorms. As a child, they scared me, especially the loud claps of thunder, but when I was sitting on my Mom’s lap, her soft hands stroking my hair and holding me just tight enough, I felt safe. Over time I grew to love thunderstorms and when it would start to rain, I knew that I would get to sit on Mom’s lap. We had a rocking chair too. Two actually. One in the living room and one on the porch. Sometimes during storms we would sit on the rocking chair. I continued to sit with my Mom until my legs had grown so long there was no more curling up on her lap, they would dangle and fall but I didn’t care I would still try to fit. I knew my Mom’s hands, the softness, the shape of her fingers, of her fingernails. I would trace her veins with my fingers. They were beautiful to me. And they still are. My Mom’s hands are different now. Rheumatoid Arthritis has made its mark. Today her hands cause her so much pain, frustration and embarrassment. But when I look at them, I still see my childhood, I see the hands that gently stroked my hair and they take me back to the stormy evenings on the front porch swing. They bring me back to the comfort I felt when she would gently hold her palm to my cheek as I nestled my head on her chest and drifted off. What did my mama do? She comforted me with her touch and for that reason, her hands will always beautiful to me. Remember back in April when I was doing the A to Z blogging challenge and I stopped at T? That’s because I got a block. A mental block. A bad one. I went two months trying to figure out what the heck U could stand for. Well guess what? I’ve now made it to U and U is for Urban Farm. When we originally bought our house seven years ago, in addition to falling in love with the house, I fell in love with the yard. Actually, I fell in love with what the yard could become because at the time it was just a “big yard”. In other words, a lot of grass. I know it’s not for everyone, but to me, plain old grass is a waste when I could be growing something. But at the time we bought the house I never envisioned that the “big yard” would transform into the garden it is today. They say gardening is a process and that couldn’t be more true. I’ve found that there may be a beginning, a place in time where our interest is sparked, but if you enjoy gardening, it will never be complete in the same way a painting or a meal or a song may be. Gardening is a never-ending journey, so if you don’t enjoy the experience you’d better get off the ride! It’s probably an understatement that I love gardening. And while the term “gardening” used to cover pretty much everything: fruits, vegetables, flowers, annuals, perennials we now have separate terms for each type. Until recently, “Urban Farm” was a gardening term I kind of scoffed at. I envisioned an Urban Farm being a small house in the city with a tiny lot. And on this farm they had a small barn, a dwarf cow, a dwarf horse, a miniature dog and a few stalks of corn in a miniature field. Since then my concept of an Urban Farm has changed, as have my own gardens. The small veggie garden changed into two raised beds and the fruits and veggies have expanded into the landscape. There has been the addition of three grape vines, hardy kiwi, and in addition to the original red raspberries that came with the house, there are now golden raspberries and blackberries as well. And then there’s the blueberry bush (bought a pair, lost one, still need to add another). Oh, and there are pairs of both pear trees and apple trees. You’d think that would be enough, but since I love to experiment with plants, it’s not. Last Thursday my son’s baseball game got cancelled due to rain and thunderstorms. I found this the perfect excuse to head to one of my favorite garden stores: Egg|Plant Urban Farm Supply in St Paul. I know I’ve mentioned it before, but I absolutely love this place. Anyway, the little trip on Thursday evening to see what’s new expanded into going back this weekend with the truck to pick-up a peach tree, cherry tree and plum tree (not to mention a few other plants for the veggie garden). And as if that’s not enough, I also signed-up for the Backyard Chicken class next weekend. I don’t like to get pecked. I was told chickens are messy. I was told chickens stink. I’m afraid Jake, my rescue dog from the Leech Lake Reservation who has BBs in his hindquarters (most likely from chasing chickens) might kill them. I live behind a nature center, so I’m afraid the raccoons, wood chucks (are they carnivores? ), fox or coyotes might get ’em. I’m afraid I’ll be a bad chicken mom. Well, while visiting Egg|Plant I talked to Bob, one of the owners, about my fears. And he asked me one question. “What’s the worst thing that could happen?” I said, “Either my dog or the other critters would kill the chickens.” His response was, “Okay, now you know the worst thing that could happen.” It took me a minute to process it, but he was right. I’ve worked myself up so badly about chickens dying that I haven’t been able to think past that point. Thanks to Bob, I’ve now realized that the worst that could happen is that the chickens will die. And if they do, and eventually, even if I care for them really well, they will, I can deal with it. So now that I know that, I can quit focusing on it. I can redirect my energy and focus on the chickens and the experience of having them. So this morning, as I continued contemplating chickens, I looked out the window on my backyard. That’s when it dawned on me that if I do this, if I get chickens, I’ll be crossing that line from an Urban Garden to an Urban Farm. I don’t have a barn. I don’t have miniature dogs or mini-fields, but I do have fruits and veggies and two full-sized dogs and a dwarf cat and after the chicken class next weekend, I might even have chickens. I might become an Urban Farmer. I just might. If you live in the Twin Cities, or once resided somewhere in Minnesota, you may think this post is referring to Monticello, MN. For those of you who were hoping that is the case, my apologies. For the rest of you, I’ll continue on. As a gardener, designer, what have you, every time I begin a project, whether it be at home or a project for a client, I’ll seek inspiration. Sometimes it’s a plant, or a tree. Sometimes it’s a detail on their home. Sometimes it’s a place they’ve traveled. Sometimes it’s nature. There are many, many things that can be my source of inspiration, but when I’m looking for some inspiration for myself, I often turn back to a place I visited a number of years ago, Thomas Jefferson’s Monticello. Now, some of you may recall I did a post about Monticello, or rather part of a post about Monticello in my History, gardening and experiments post about a year ago, but Monticello made such an impact on me I figured it was worth visiting again. What’s so special about that place? Well, what’s not to love? Ive you’ve ever been to the East Coast, or “down South” for that matter, I’m sure you’ve visited at least one or two plantations. And while many of them are similar, at least to me, Monticello was different. Sure, they have the huge estate, the enormous tree lined drive and massive spans of lawn, but at Monticello there’s something more. Gardens. Amazing gardens. Now, I’m going to stop for a moment. I don’t want to go any further without acknowledging what took place back in the time Thomas Jefferson was at Monticello. That was a time of slavery. I also don’t want to ignore the fact that Jefferson had slaves, because he did. Many of them. And this plantation, like all the other plantations at that time would not have existed had it not been for the slaves who took care of them. So while I wish slavery had never existed, I’m also very grateful for the slaves Thomas Jefferson had, because had it not been for them, the gardens I fell in love with would also not have existed. So to the slaves, and the descendents of the slaves, I thank you. So what about Monticello is so amazing? Let’s see, where to begin? Let me start by saying this is a gardener’s paradise. Whether you like annuals, perennials, fruit trees or veggies, it’s there. And do you like heirlooms? They have heirlooms, not only veggie heirlooms, but how about roses dating back to the 1400s? They even have the Thomas Jefferson Center for Historic Plants! What else? Okay, Thomas Jefferson was a gardener himself. And what I mean by that, is that he tried, experimented, tried again. He planned the estate with curving pathways and flower gardens. He created micro-climates by installing terraces on the South side of the hill to plant a veggie garden, and orchards with apples and apricots, peaches and pears, pomegranates, cherries, plums, nectarines, even almonds and olive trees. And there’s Mulberry Row. Many people pull mulberries thinking of them as “weed trees”. Not Jefferson. He planted them intentionally. You’ve never seen Mulberry Trees look so stately. And why not? The berries are wonderful! (Add that to your edible landscape.) And the vineyards, yes he had two. Okay, okay. I know I get excited, but this all happened in the 1700s! And what’s equally cool is that many of his plans, meaning, yes, sketches of the grounds, still exist. Now, granted, the original plants are not there, but they began restoring the gardens in the 1980s to bring them back to what was once there. Not to mention, heirloom seeds and plants are not only used on site, but also available for purchase if you have the inkling to do so. There are so many things about Monticello that I love. Oh, and not just outside either, of course Jefferson had amazing tropicals growing indoors as well. If you want to take a peak, catch a little history and get a little inspiration, the folks at Monticello have done an amazing job on their website and have also created the Monticello Explorer, which lets you take a little tour from your desktop so you can catch a glimpse of this amazing estate. There are plenty of photo galleries of the house, gardens and plantation as well. And, like I mentioned before, they even have an online store where you can get plants, seeds or a replica artifact or two. So as much as I would love to hop a plane and fly out and stay for the summer, instead I’ll be taking a virtual journey to Monticello today. I’d love for you to join me! And I almost forgot to mention, next week is Historic Garden Week (April 21 – 28) so if anyone would like to take me on a surprise trip, I’ll go! Technically Friday was the letter “F” but I still have a very tight bond with my PJs, my bed and my couch, so today will be a two-fer. Back-to-back posts. As I struggled to think. Period. The past few days, I struggled even more with what to post for “F”. That’s when, while bonding with the couch, at the end of one of the movies my son was watching I saw a Flowering Crab tree and it reminded me of the one on the side of the house. The first spring in our house I fell in love with that tree. I have never really had a “thing” for Flowering Crabs, because frankly I thought they’d been over-used, until that spring. Our house was built in 1940 and while it’s doubtful the tree is 70 years old, it’s likely a good 40 or 50. 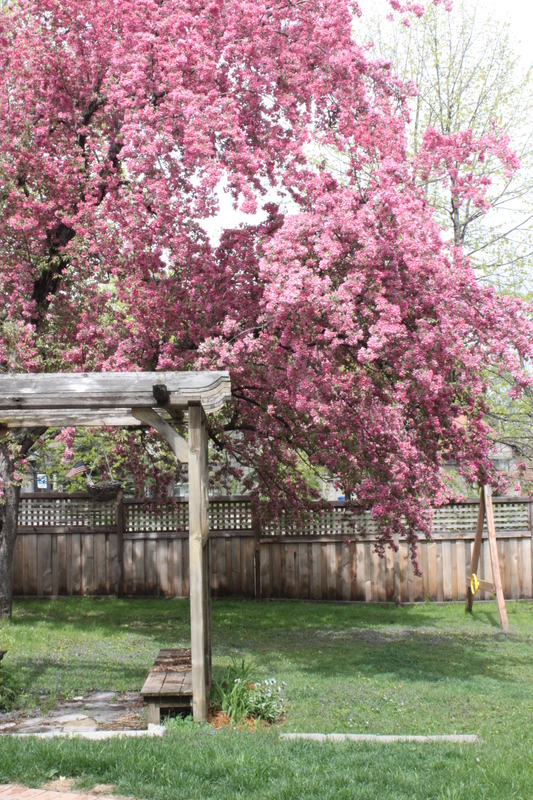 It stands so tall, so full, so beautiful with its dark pink blossoms and branches that call you to climb or hang from them. But about 3 or 4 years ago, we got a late storm with heavy wet snow and freezing rain and it took down a large branch from the tree, changing its shape forever. I was heart-broken. The rest of the tree still stands to this day because I don’t have the heart to remove it and trimming it will make it look, well, kind of dumb. Besides that, I wanted to try grafting a branch or 2 from the top-stock onto one of the suckers from the rootstock and I finally tried a few weeks ago. Unfortunately, my grafts didn’t take, so the tree will be there for at least another year until I can give it another try. In a few more days it will once again be in full bloom and I will still honor it as though it were without a flaw, because in my mind’s eye, that’s how I still see it. May you find a tree in your life that you love as much as I do this one.